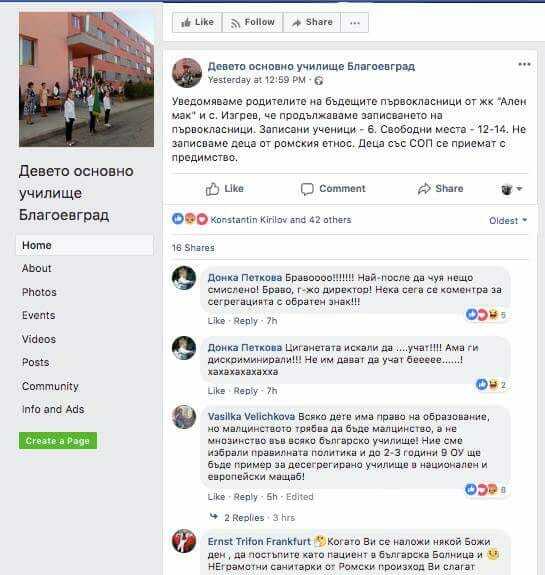 On 29th of June, a post on the facebook page of the Nineth Peyo Yavorov Primary School in Blagoevgrad was published, containing the sentence "We do not admit children of Roma ethnicity". Without declaring it outloud, dozens of school principals across the country follow the same "policy." As a result, the so called "elite" schools, where are taught only children of Bulgarian ethnic group, were formed in the big cities and small towns, turning more than a hundred schools in the same settlements into secondary-segregated. Although the schools are located in Bulgarian neighborhoods mainly Roma children are taught there, and the Bulgarian children living near those schools have been enrolled in "elite" schools. In addition, more than 60 primary-segregated "Gypsy" schools are functioning in Roma neighborhoods of district centers and small towns. Amalipe Center for Interethnic Dialogue and Tolerance expresses indignation at the post of the 9th Primary School - Blagoevgrad, on their facebook page! Whatever the context and the arguments, that sentence is not only a violation of basic legal and regulatory acts. It is unacceptable and absurd, throwing a spot on the efforts of hundreds and thousands of principals and teachers working daily for the better education of all children! We also express our disagreement with the widespread practice of creating "monoethnic" schools ("Roma" or "Bulgarian") in multiethnic settlements and the lack of adequate actions and policies to stop this process! Educational segregation is one of the main threats both to the development of Bulgarian education and to the overall social and economic development of Bulgaria! 4. Political action by the Ministry of Education and Science for the prevention of educational segregation and for overcoming the existing segregation: initiating a proposal for legislative changes. The quality education of every child in a school environment, which is open to all ethnicities, is a key prerequisite for the modernization of Bulgarian education and any obstacles should be instantly removed!